There comes a time when it it truly time to swallow a few advil pills, so as to relieve the Neck Ache that you would endure when your Noggin snaps hard one way , to catch a Glimpse of this fantastic CB4 CB100R machine. Nothing quite like it from the Japanese Icon for a long time and it is time for them to stand up and stand proud when it comes to the New modern Muscle Bike that can flex more than Arnold Schwarzenegger ever could. This Power house Four is just what the Doctor ordered as Honda seemed to be dragging its heels recently as Yamaha, Kawasaki and even Suzuki bought out tough looking and eye pleasing Machines, so, well done HONDA, as this is sure to be a winner, as long as they can make it affordable and not get too Ducati-Ish in their pricing. OK-here is the down low so far. Forget your Panigale V4s, your updated Africa Twins and supercharged Ninja H2 SX hyper tourers for a moment, just kindly send one of these our way, please. 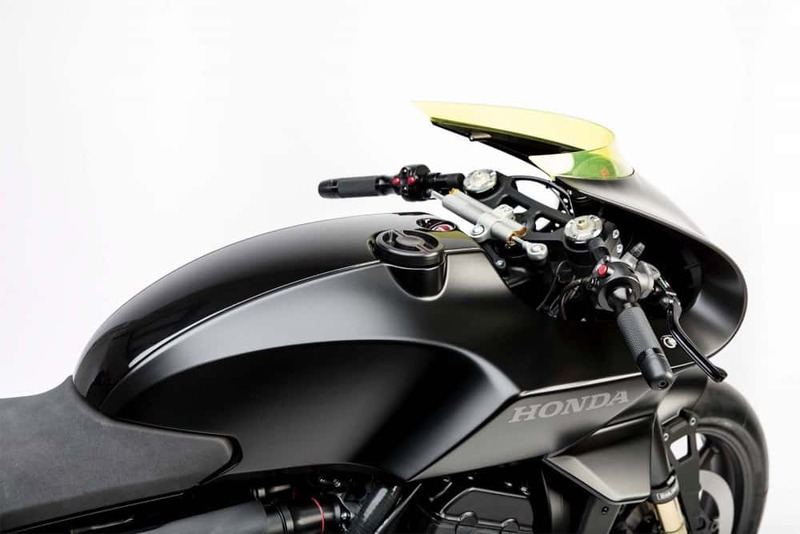 Unveiled at EICMA show in Milan today, this Honda CB4 Interceptor concept has us all drooling. 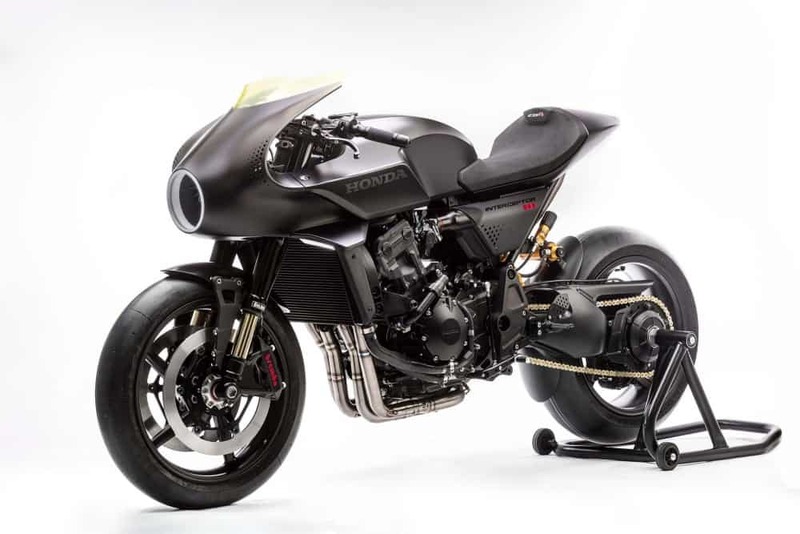 Created by Honda Rome’s R&D department, the concept has a distinct cafe racer/endurance vibe and is blessed with a profile that looks just right. While the engine is based on the competent and gutsy CB1000R, the sleek styling and creative detail touches is what has caught our imagination. In place of where a traditional headlight would sit is a fan that powers the touchscreen dash with the actual headlight looking more like a ringflash, circling around the perimeter of the fan. A start button, more typically seen on sports cars, sits in a recess at the front of the fuel tank. The tiny screen looks like it would flip up enough air to take the weight off wrists and we absolutely adore the nod to the original FireBlades from the 1990s in the drilled fairing holes either flank of the cowl. They were originally intended to reduce resistance when flicking the bike from side to side, but here they’re more likely to suggest a sporting prowess to the bike. 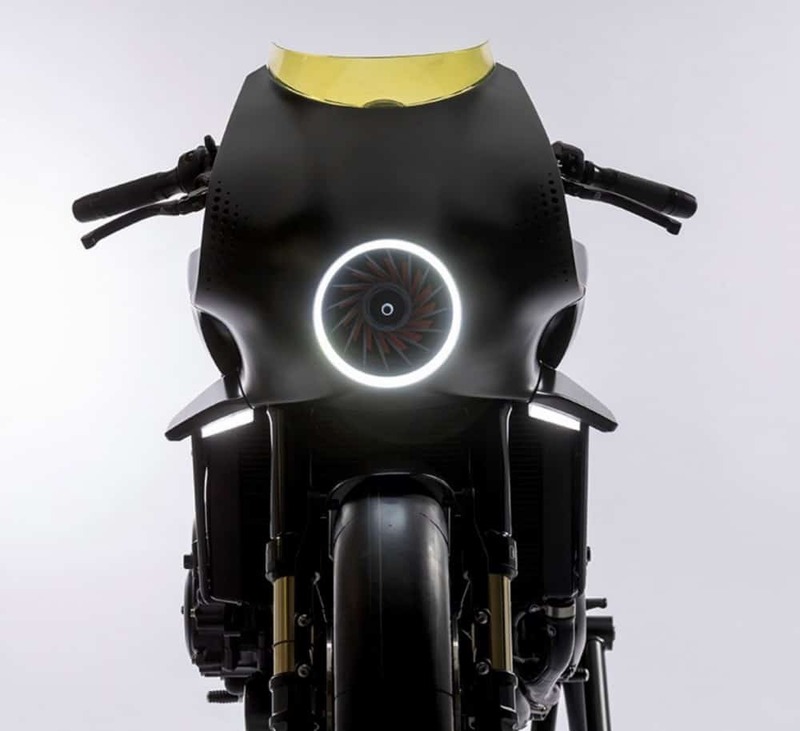 A fan sits where the headlight typically lives and powers a touchscreen display. The single-sided swingarm may add a little weight but the trade-off in aesthetics is worth it in our book. 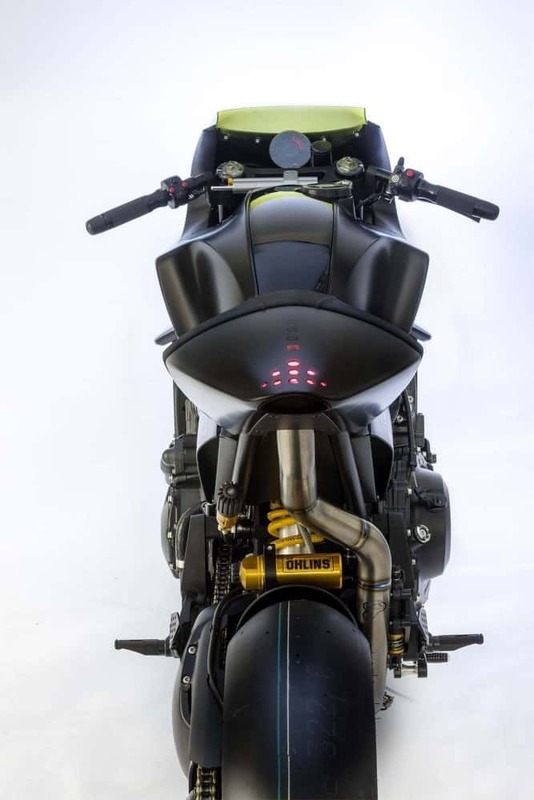 Almost as if to allow your eyeballs to fully appreciate the view of the back wheel the exhaust routes under the tail unit, before exiting out of the back. This is just plain and Simple Baddassary in its finest form, I mean, what is there not to like about this Ton Up Machine? I cannot stop looking at it, I did love the 2008 version when they made a concept bike to go with the lines of the Caff era but this is just a balls out to the wall machine. A race horse and not handicapped in any way shape or form. 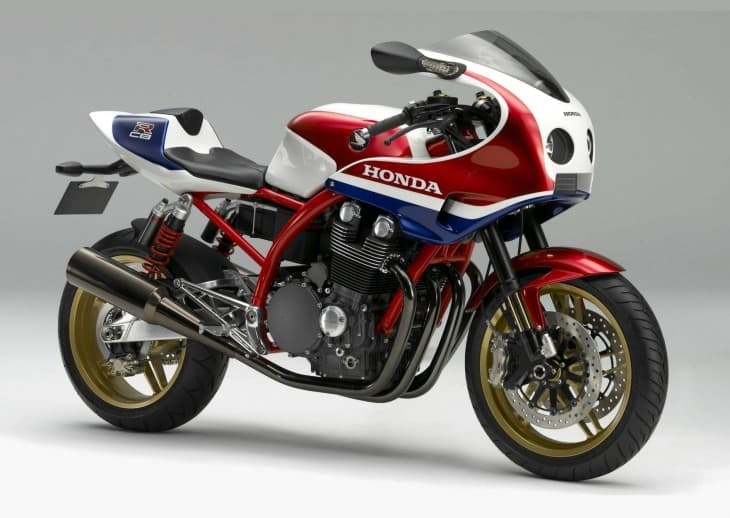 here at www.carpyscaferacers.com I would dearly love to test ride something like this, I love my Thruxton be this would out handle it in any corner, straight away or track time , so fingers crossed on this HONDA. This is something I would of designed if I knew how to use Solid works software, and I am so stoked to see that the styling has flown throughout the whole motorcycle, what a wicked machine. Above: I did love this when it first entered the Tokyo show and wanted one badly and, was in talks about maybe flying over to sample this delicious machine, unfortunately the market over here just didnt seem to be interested, I was gobsmacked, so I hope that this latest rendition will turn the big wigs heads here as it is something that triumph and Ducati will be most concerned about when this hit the public highways. 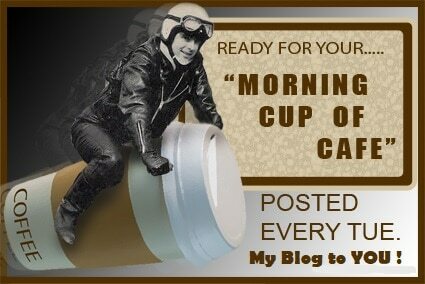 I will be keeping my ear to the ground on this machine as it is about time that Honda stepped up at the plate and hit a Home run on the first Pitch, and this looks like the Babe Ruth of Motorcycles right now, so………………………….PLAY BALL! 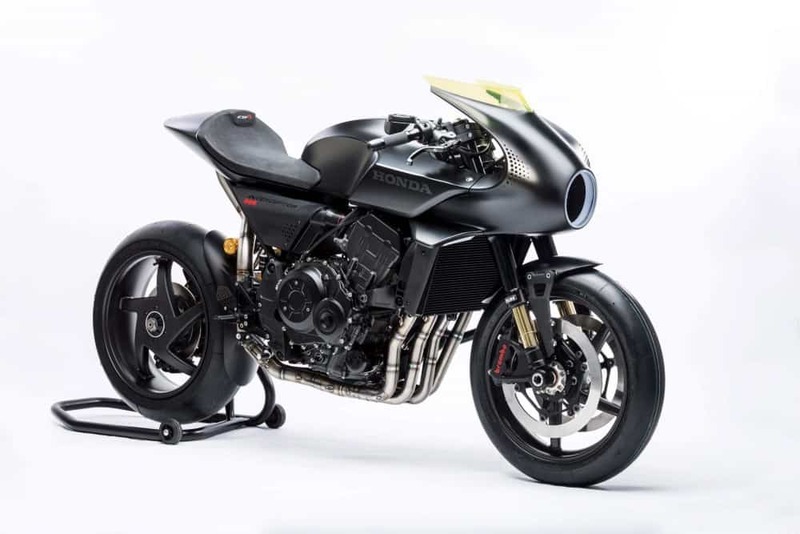 This entry was posted in Blog and tagged Brembo, CB1000R, CB4, concept, Honda, Interceptor, japanese motorcycle, Modern Cafe, single sided swing arm, Street Bike.